Who is your favourite for the Australian Open this week? Williams? Azarenka? Nadal? Djokovic? Enjoy them while they last. --Better yet, implore them to stop playing. Before real tragedies happen. The 2014 Australian Open started under impossible conditions: temperatures have soared all over Australia, and in Melbourne it was 42C today, or 108F. At least it's not humid. But it is, shall we say, non-optimal for athletes to perform at their top. This tournament has been marked with players (and one ball boy) collapsing on the court. Australia's wild weather has been in the news often in the past few years; and all those droughts and floods, like the current heatwave, have been linked to man-made climate change. 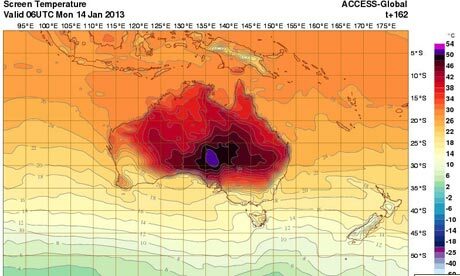 One episode of excessive heat has prompted the Australian Bureau of Metereology to add a new colour to its temperature maps - for the range 52-54C (126-129F). No wonder even kangaroos are collapsing. I hope the tennis players all walk out of that tournament together. They don't deserve to be exposed to this kind of health risk. I don't pretend to know why the organisers of the Open refuse to close the games, but I do have a guess at one of the reasons: As usual, follow the money. There are heaps of money swirling around world-class tournaments like this: money flows to the city of Melbourne, the Australian tourism board, the advertising income for the channels broadcasting the event, and who knows who else. I love to watch a good tennis match. (Almost as much as snooker). It makes me mad to see top players wasted on the court just because some official doesn't have the spine to stand up to whatever pressure may surround him to make the games go on. I hope the players walk out of the Australian Open. I hope the void in the tv programming of popular channels like ESPN and Eurosport will be filled with their interviews, and that they will tell just how brutal it was out there. I hope they will make a connection to global warming in front of an audience of millions. I hope their managers allow them to. How can you play world-class sport in an age of wild weather? The soccer world championships are played in Brazil this July: it will be winter then, and cooler than the current heatwave blistering Brazil and Argentina. You can't play soccer at three-digit temperatures, either. Global warming has got to stop. Or soon all the world-class sports left will be things like snooker, chess, and games played in a swimming pool.